If you’re looking for a beautiful holiday destination these Christmas holidays then look no further than the spectacular Margaret River region. Here in Margaret River there are so many family-friendly things to do and so many gorgeous places to go and see! Most wineries here are family-friendly with kid’s menus and some even have playgrounds for the kids to enjoy while you sit and relax. After visiting a couple of wineries you may like to take the kids to visit a chocolate or fudge factory. There are also plenty of lolly shops and ice cream cafes to indulge their sweet treats! If you’re family is interested in horse riding this is the place to be with various companies catering from the beginner to the experienced rider. There are also whale watching cruises and snorkeling adventures to be had. Here in Margaret River there is something for everyone. Maybe you would like to do some sight seeing? The Mammoth and Jewel Cave’s are amazing places to explore. Plus the lighthouse is a delight to visit and take some beautiful family happy snaps. If you’re wondering how to get around to all these awesome places we have to offer here in Margaret River – Then wonder no more – At Cape to Cape Wine Tours and Charters we can organise custom tours for private groups, large and small. We can organise an amazing day out for your family and friends. Contact us today, and one of our friendly staff will help arrange the perfect tour for you! 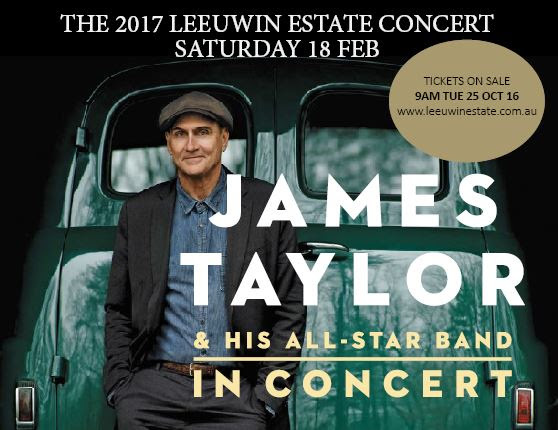 Tickets are on sale NOW from www.leeuwinestate.com.au for James Taylor and his All Star Band. They will perform at the annual Leeuwin Concert on Saturday February 18, 2017 in the beautiful Margaret River. James has sold more than 100 million albums and won 5 Grammy Awards. He has won the hearts of music lovers of all generations and even President Obama is a fan! It is such an honour to have him perform at the Leeuwin Estate concert and we would love for you to join us there. Cape to Cape Wine Tours and Charters offers transport to and from the concert safely and conveniently. We take the stress out of parking, and also the problem of having to chose a designated driver – Therefore all can relax and have fun. Talk to us today about how we can help with your transporting needs – Whether it be a romantic luxury drive for two – or a party of fun for a larger group in one of our minibuses or limbusines. Our services for the Leeuwin Concert night book out very quickly so Contact Us today! But what is the difference between Beer and Craft beer? Craft beer is brewed using specific hand selected ingredients to bring out certain flavours – the outcome is exquisite flavourful quality beer. When it comes to the usual beer you have down at your local – that is usually made in large factories using bulk inexpensive ingredients. Beer tastes like beer, whereas craft beer tastes like ingredients that were hand picked to add to its flavourful aroma. You may find some craft beers that taste like chocolate, caramel, coffee, different fruits, floral, citrus, nuts and smoky undertones. Some may even have hints of pumpkin or coriander. Craft beer is served by carefully pouring into a special glass, ensuring it is just the right temperature so that all the colours and flavours are released and able to slowly intertwine. The usual beer is served ice cold from the can, bottle or on tap. The colour of beer is usually yellow, copper or brown in colour. Craft beer is found to appear in a wider range of colours due to the difference in hand selected ingredients within the brew. Overall Craft brewers focus on quality – not quantity. They want the flavours and aromas of their specialty brews to never be forgotten – to be a memory that is always on the tip of your tongue. The Margaret River region is famous for its wines. But as the winemakers love their wines, they also love their beer! The Craft beer industry in Margaret River is one of the fastest growing in Australia. There are now many breweries in the Margaret River Region that boast a variety of gourmet foods to accompany that perfect beverage. Most are family friendly offering play areas and activities for children – Great for school holidays! So if you love quality beer why not check out the amazing ranges of different Craft beers at our local breweries – we would love to assist you in a personal custom tour with someone special, a group or with the family. Here at Cape to Cape Wine Tours & Charters we are so excited to announce that tickets to one of our favourite yearly events are going on sale TODAY! The Margaret River Gourmet Escape is back this November 2016! With many exciting favourite and new events, this year is set to impress! Be sure to contact us to see how best we can help you to enjoy this event to the max with your own customised transport and tour program. Just a few short hours’ drive from Perth, the Margaret River Region of Western Australia is 110km of fun packed holiday destinations, with pristine countryside, beaches and forests, wineries and microbreweries, cafes and restaurants, and, of course, a fantastic retail presence. Here at Cape to Cape Wine Tours & Charter, we know the area well. That’s because we’ve been running tours for 10 solid years. To celebrate, here are our Top 10 activities in the Margaret River Region that should be on your ‘Must Do’ list when visiting this beautiful part of the world. If you are a fan of fine wines and beautiful countryside, you cannot go past a Wine Tour of the Margaret River wine region. Almost 50 years old, the area is now jam packed with both white and red varieties with more than 95 cellar doors, producing 20% of Australia’s premium wine. Prefer a drop of ale to wine? No problem. Although Margaret River region is famous for its award winning wine, craft beer and microbreweries are popping up to satisfy the thirst of even the most discerning beer enthusiast. The Cape Leewin Lighthouse sits on the most western point of Australia, offering spectacular vantage point of the Indian Ocean, Southern Ocean and, at the right time of year, whale spotting! With an exciting maritime history, this landmark has stood the test of time to remain a vital working lighthouse to this day. You may not be aware, but as much as going on top of the ground, is going on underneath it. Margaret River region is home to a labyrinth of limestone caves formed approximately a million years ago. With the option to explore more than 150 caves from gentle walks to exciting abseiling, this is an attraction not to be missed. Whether you head out to the original factory 20 minutes from Margaret River or the CBD-based factory where the current gourmet delights are created, what a better way to top off that full day of sightseeing in the Margaret River Region than with a mouth-watering range of chocolates and a nightcap? The stunning coastal region of the Margaret River offers an inspirational canvas to artists abound. You will find an abundance of art and craft galleries throughout the region, and you are sure to find something to suit your taste including ceramics, metals, paintings and jewellery to name a few. Tailor the length of your tour and evoke the artist, or shopper within you. What could be better than hiking along the idyllic Indian Ocean Coastline, savouring beautiful beaches and awe-inspiring cliffs, local flowers and Australian native wildlife? Join us on a guided tour, you choose the length that suits you best and enjoy one of life’s great experiences. Stop and enjoy the best of the Margaret River with cafes and wineries close by for a day of rest. With whale season about to begin – now is the perfect time to book. Indulge your inner foodie at this cottage café and garden, famous for country style dishes and sweets. The Berry Farm offers gourmet food products to suit a variety of tastes, and a range of wines and fortifieds known across Australia. Recently winning a Trip Advisor Certificate of Excellence a trip to the Margaret River is not complete without a visit here… If that’s not enough to tempt you they have recently added cider to the well known beverage menu. With origins dating back to 1966 the award winning Margaret River Dairy Company offers gourmet dairy and artisan cheeses such as, Camembert, triple cream Brie, cheddars and yogurts. These Italian cheese makers offer their epicurean delights set amongst picturesque green pastures and roaming dairy cows. Why not couple this tour with the Berry Farm and let your taste buds guide you on this gastronomic feast. Boasting a 21-year-old history, this 3 metre high hedge maze is one of the largest in Australia, and is a unique experience for the kids, or the kid in you. With a variety of mazes, golf, outdoor games and breathtaking gardens featuring some of Australia’s most beautiful natives. Test your skills on this fun day out… not to be missed! Love the sound of any of all of these? We specialise in private group charters for all of these activities from 2 people to larger groups. Contact us to organise a tour around the Margaret River area today!